One trip to your local Kroger store and you can make enough healthy school lunches to last for a month! Is it me or does summer always seems to fly by? And when summer ends, school starts – which is enough to jolt me out of my watermelon-induced hangover into a world of stress. Schedules become jam-packed, nights are spent reviewing homework assignments, and tanning lotion is traded-in for glue sticks and popsicle sticks. 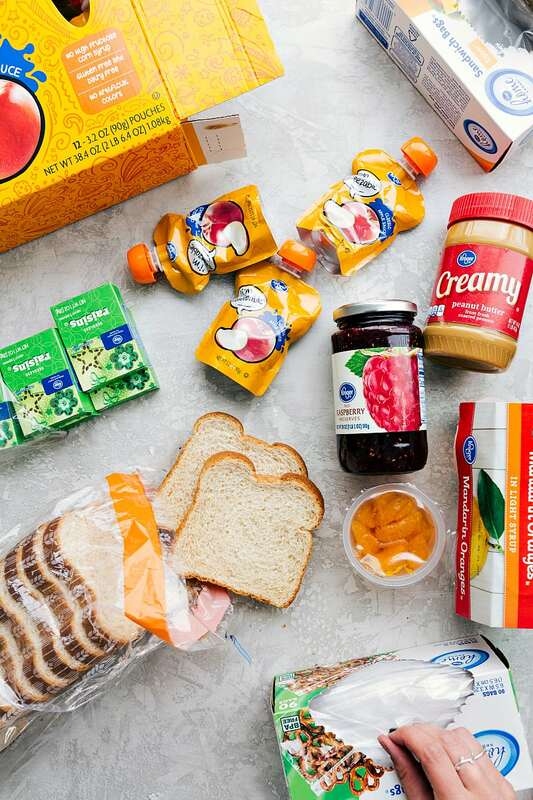 And if you’re like me, it can be difficult to stay on top of healthy school lunches, which frequently turn into a Frankenstein assortment of whatever I find in the pantry. 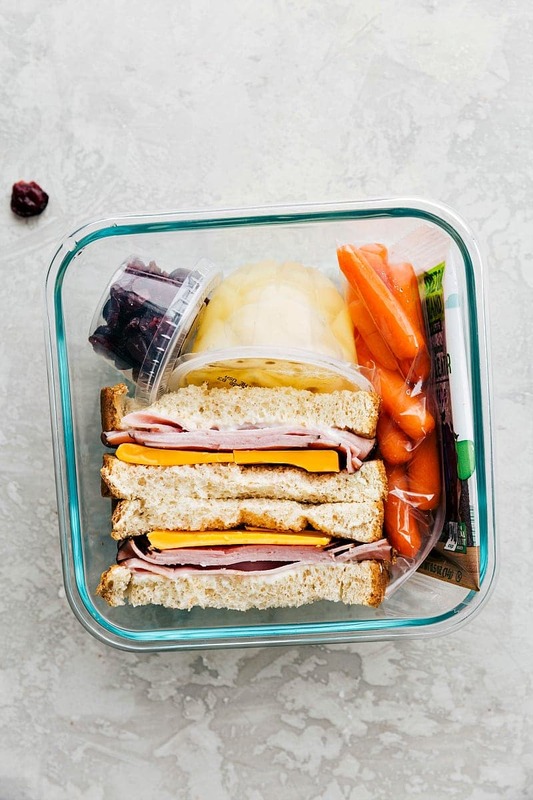 If you pack lunches for your kids you know how much time and effort that can take (especially for healthier meals). That’s why today I’m excited to share some tips, ideas, and recipes to make healthy school lunches as easy as possible. I took the concept of pre-making a month of freezer meals and applied it to school lunches, tried it out in my house, and am thrilled to tell you all what a huge success and time saver this has been for me. 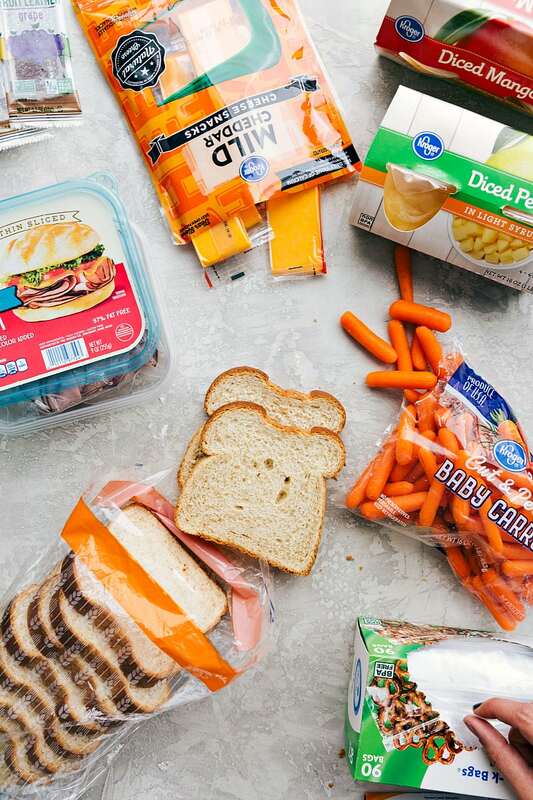 Using Kroger Clicklist (online grocery shopping), and a couple of hours of prep time, you can have an entire month of healthy school lunches prepped that are healthy and taste great. 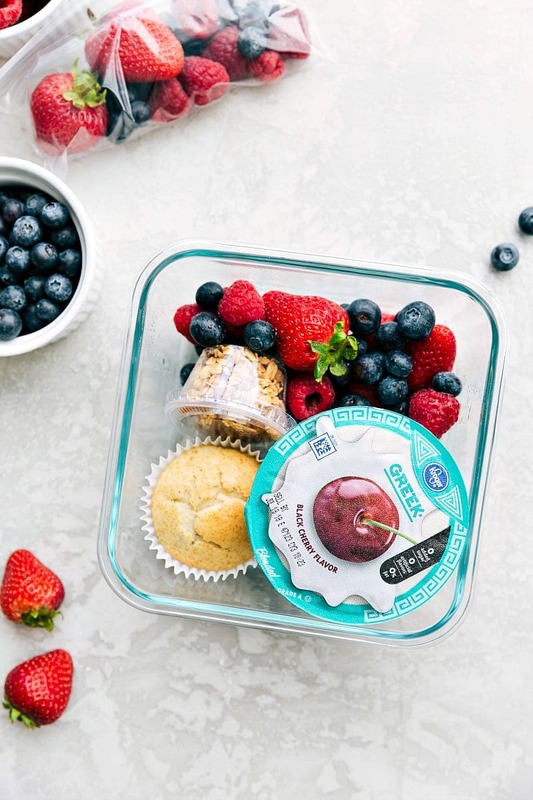 If you choose to include perishable items (such as yogurt and fresh berries) in the lunches, I wouldn’t recommend buying a month’s worth of those items at a time. Instead, pick up what you need for that week(s) during your normal shopping trips, and with everything else prepped, those items can be added to the lunches quickly. So with that, let’s dive right in! First up are peanut butter and jelly sandwiches. These can also be peanut butter and honey (my boys’ favorite), OR if you’re in a school that restricts peanuts, you can use WowButter instead of peanut butter. Everything for this lunch can be prepped ahead of time. Did you know you can freeze peanut butter and jelly sandwiches? Just like store-bought frozen uncrustables, you can do it yourself and they taste great once thawed! 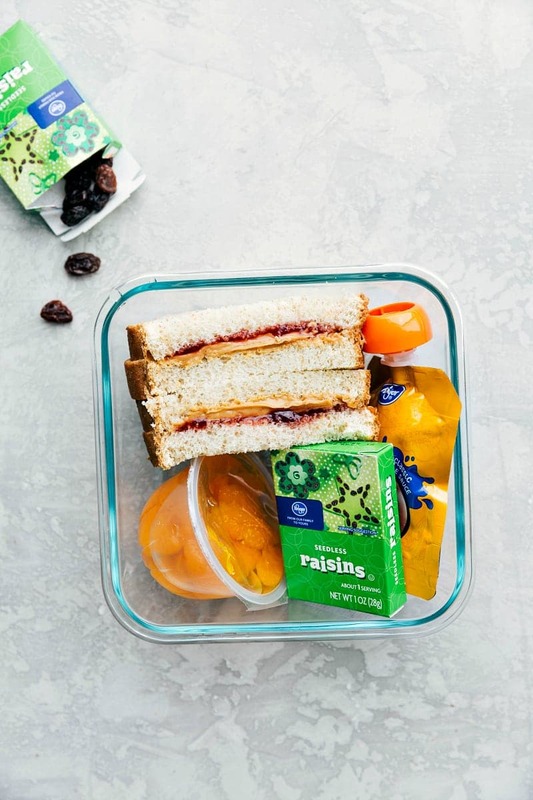 Freezing peanut butter and jelly sandwiches is really simple and makes for great healthy school lunches. Start by spreading peanut butter on both sides of each piece of bread. Then, spread the jelly or honey on top of the peanut butter on one slice of bread – just be careful to avoid the edges. Close the sandwich and seal without any air in a ziplock bag. Repeat for 4 sandwiches total, and place all the sandwiches in a freezer. You can also add in extra veggies you have leftover in your fridge. We always have baby carrots, baby peppers, mini cucumbers, and cherry tomatoes. These would quickly go in a snack size bag and right into the lunchbox/bag. Morning of: Grab one of the sandwiches from the freezer and pop it in the lunchbag/box (it will defrost by lunch time!) along with the other lunch components. Next, bagels with cream cheese. My kids LOVE bagels and even more so if they’re mini bagels. To keep this lunch on the healthier side, get some whole wheat cinnamon raisin bagels. Use whatever cream cheese your family likes best! Bagels also freeze really well: I just place two miniature bagels in a ziplock bag and throw those in the freezer. Whipped cream cheese and cheese sticks stay good for a couple of months, so I put some of each in my fridge so they’re all ready to go. 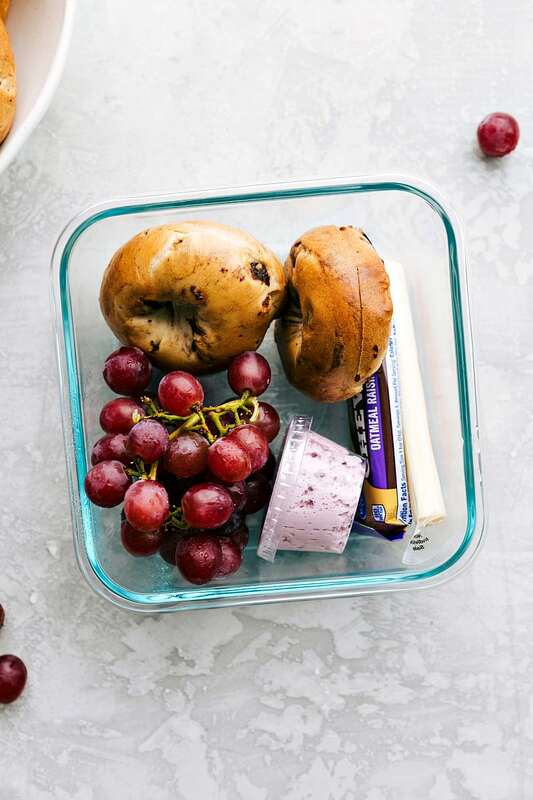 Morning of: Grab one of the bagels from the freezer and pop it in the lunchbag/box (it will defrost by lunch time!) along with the other lunch components. Third, pancakes (or waffles) topped with berries. Can you tell my kids love breakfast food?! To keep this lunch on the healthier side, you can make homemade whole wheat waffles/pancakes. I like to top my pancakes and waffles with pure maple syrup! This is easily my kid’s favorite lunch, and I love it too because it’s so easy to make! Prep this lunch by making a large batch of waffles or pancakes. Let them cool completely, place them in sealed bags, and pop them in the freezer. 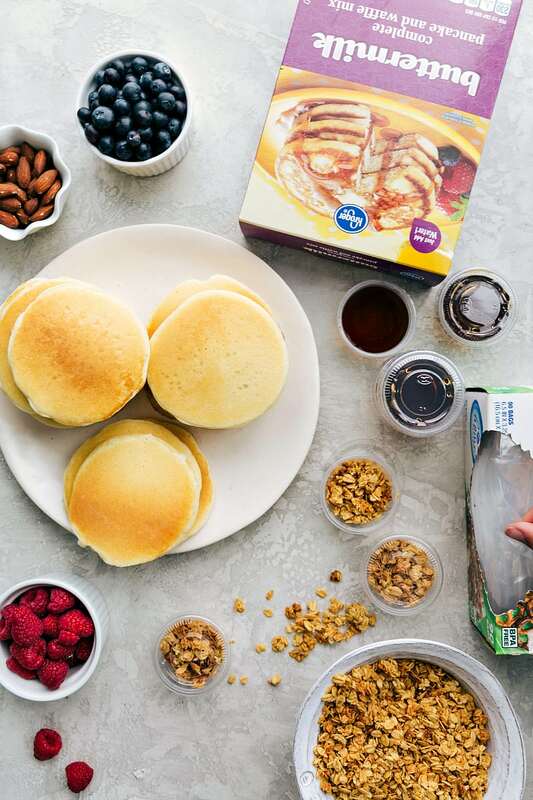 If you want these prepped in a hurry, Kroger has an amazing buttermilk pancake and waffle mix which I think is delicious. Maple syrup has a great shelf life so I just put it in small containers and keep that sectioned-off in the fridge – along with the cream cheese and cheese sticks! I then put some healthy granola and nuts into small ziplock bags to use as toppings. Set those aside with the other sides that don’t need to be refrigerated. 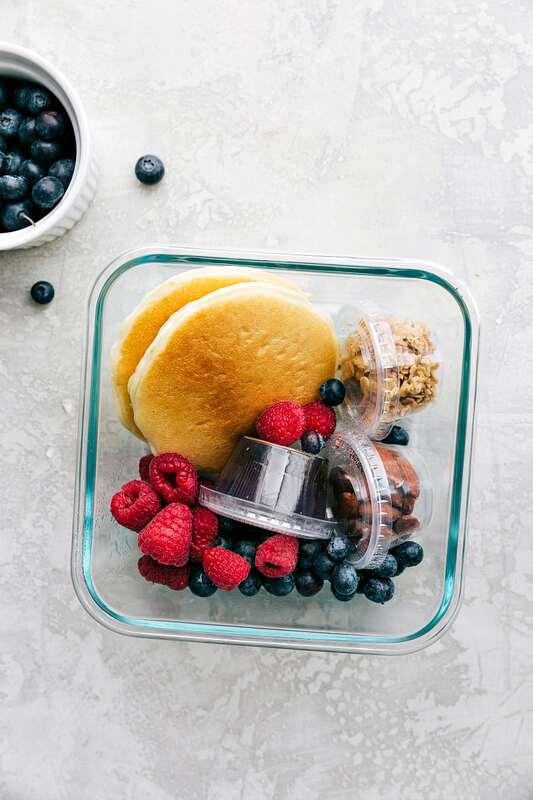 Morning of: Grab the pancakes/waffles from the freezer and pop it in the lunchbag/box (it will defrost by lunch time!) along with the other lunch components. Fourth, ham/turkey and cheese sandwiches. Did you know you can freeze deli meat and cheese sandwiches and they taste great when thawed? To make these sandwiches, spread softened butter on both pieces of bread (this helps keep the bread from getting soggy). Next add a few slices of your kid’s favorite deli meat, then top with some cheese. Close the sandwich and seal without any air in a ziplock bag. Repeat for 4 total sandwiches and then place all the sandwiches in the freezer. And finally, yogurt parfait. 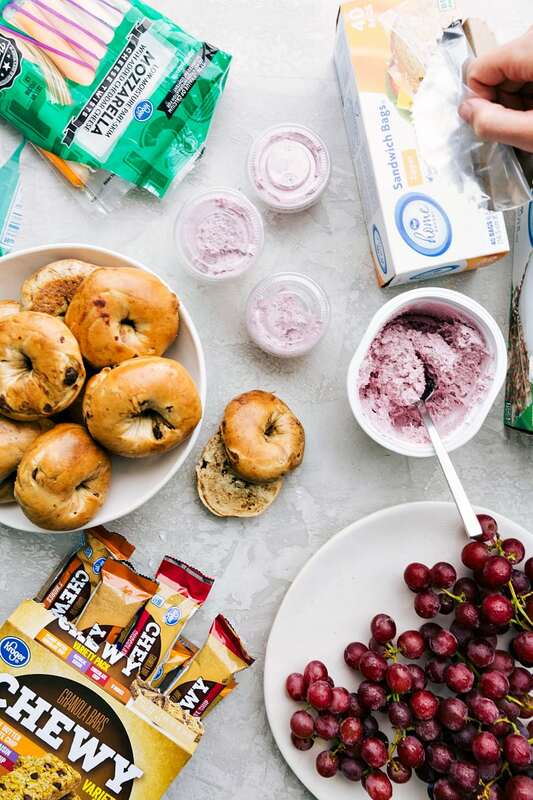 This lunch is a little harder to prep entirely ahead of time since yogurt stays good in the fridge for about 2-3 weeks, but you can prep all the toppings and sides, including the granola and muffins. Thaw the muffins by either leaving them out at room temperature for a few hours, or put them in the microwave. To thaw in the microwave, place one UNWRAPPED muffin on a napkin or microwave-safe paper towel or plate. Microwave on high for 15-30 seconds for each muffin. 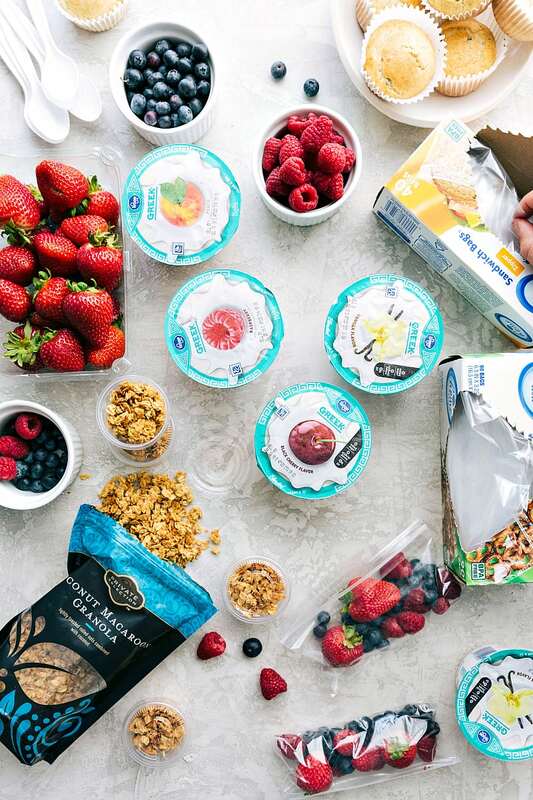 Fresh Fruit (purchase week of): fresh berries. Morning of: Grab one of the muffins from the freezer and pop it in the lunchbag/box (it will defrost by lunch time!) along with the other lunch components. I’m so excited to be partnering up with Kroger this year to bring you delicious recipes including these healthy school lunches! This post is brought to you in partnership with Kroger, but as always, all opinions are my own. I’m so sad all of the Krogers in my area are closing down this month. Kroger brand peanut butter is the actual best! Oh no!! I’m so sorry to hear that! I LOVE their peanut butter! Such great ideas, thank you!! Where did you get your lunch containers? From Smith’s 🙂 (My local Kroger store) And you are welcome!